After building up some serious anticipation for our hike to the highest point of Hungary, we finally got to go hiking in Mátra on May 6th. We welcomed a lot of new hikers to Budapest Hikers and were so excited to show them part of Hungary. Almost 50 hikers joined us for the Mátra hike, even though we expected some rain. Lucky for us Mother Nature showed us some mercy and we got through the hike without rain and even saw the sun! The first friends were made during the bus ride to our destination, and the first pictures were taken a few steps after the start. We had a great group of Budapest Hikers that bravely adventured through the mud, under and over fallen trees and along some stunning scenery. The highest point of Hungary marked our lunch break. We had a delicious meal on the mountain and got to see the wide views over the surroundings from the television tower. After the mandatory group picture, it was time to descend back to our bus. After hiking to the highest point of Hungary, we gathered a group to have burgers and beer in the famous ruin bars of Budapest and connect with more of the hikers. What a great group we had again! 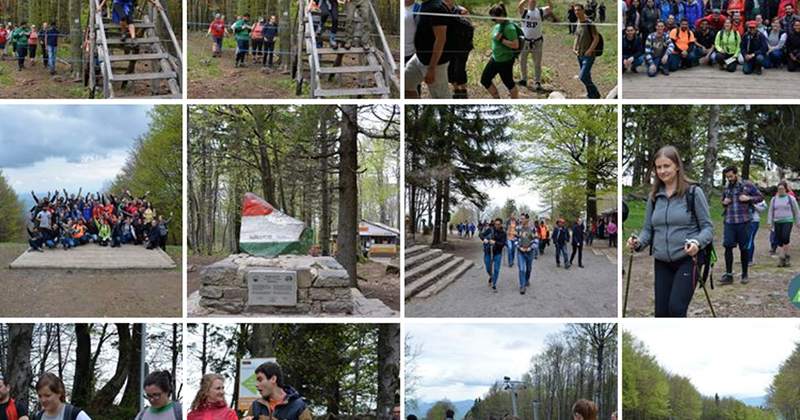 Want to see more pictures from the hike? Check them out on our Facebook page! We love discovering Hungary while hiking, and it’s even better to share it with you. Our next hike is taking place on June 10th and our destination is the famous Balaton Lake. We’ll do a hike and are planning some relaxing time on the beach at the Hungarian Sea after. Join us for our hike to Balaton; make sure to reserve your ticket here.